Tribes Overall: "it by far exceeded my expectations. I was completely blown away by the experiences daily. 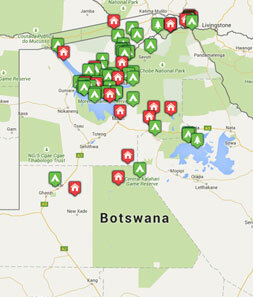 I was a first time, solo traveller to Botswana. I couldn't stop saying 'Amazing'. I felt very lucky to have the experience"
Tribes Service: "Very very helpful. I gave a very brief brief, with little insight into what I wanted to do or where I wanted to go. Sinead was excellent in putting together a trip which was perfect. She kept me informed, but didn't hassle me, communicated in a very professional but friendly manner. The trip worked seamlessly in terms of connections, being met at airports, accommodation etc"
Guides: "So knowledgeable about everything from flora, fauna, animals, national and continental history, polite, helpful ... They love to listen to your stories and will generally share stories about their lives too." Social & Environmental Responsibility: "Tourism in this country and area is a key source of income which in turn helps local people. I worry that the amount of trucks in the area on safari will eventually have an impact and the animals are becoming so used to cars it almost takes away from their natural environment. However, if we want to explore these parts of the world then I guess there is no other option. The safari's are done in a very sensitive way and respect the animals and the environment. " This was super luxury for me. I didn't really know what to expect but I was blown away with the standard here. From the singing on arrival, to the standard of lodge, personal guides, quality of food, dinner in the bush to the range of animals I saw - it was incredible. "The light aircraft flight was quite special having done this before it was an amazing experience to see the delta from above Watching sun rise and sun set - so unspoilt Loved having no power (Oddballs only) or technology - soooo relaxing The elephants being in camp - amazing, so natural but felt so safe Sitting around the campfires for breakfast and after dinner The range of animals you see and the various settings, so natural and amazing!"